1977-03-08. New. Ships with Tracking Number! INTERNATIONAL WORLDWIDE Shipping available. Buy with confidence, excellent customer service! Tan Books and Publishers Inc., Rockford: 1977. Softcover. Good condition. One of the least known and most easily disbelieved religious facts is treated here in a scholarly and competent manner. As a result of this work, many will finally understand that bodily incorruption is in fact a reality in the world of religion. ISBN: 0895550660. 1977-03-08. Good. Ships with Tracking Number! INTERNATIONAL WORLDWIDE Shipping available. May not contain Access Codes or Supplements. May be ex-library. Shipping & Handling by region. Buy with confidence, excellent customer service! Rockford, Ill: Tan Books and Publishers, 1977. First edition (unstated). Paperback. Very little wear to spine head & foot, light few creases to spine, very gently rubbed corners, ownership bookplate to front free endpaper, few marks to covers, else very good.. White octavo; 310 p, b&w illus ; 21 cm. Paperback original. || Christian saints -- Biography. || Contents: Saint Cecilia (Unknown-177) -- Saint Agatha (Unknown-251) -- Saint Etheldreda (630-679) -- Saint Cuthbert (Unknown-687) -- Saint Werburgh (Unknown-699) -- Saint Guthlac (667-714) -- Saint Withburga (Unknown-743) -- Saint Wunibald (702-761) -- Saint Alphege of Canterbury (954- 1012) -- Saint Romuald (952-1027) -- Saint Coloman (Unknown-1012) -- Saint Edward the Confessor (1004-1066) -- Saint Waltheof (Unknown-1159) -- Saint Ubald of Gubbio (c. 1100-1160) -- Saint Idesbald (Unknown-1167) -- Saint Isidore the Farmer (1080-1172) -- Saint Benezet (Unknown-1184) -- Saint Hugh of Lincoln (1140-1200) -- Blessed Bertrand of Garrigua (Unknown-1230) -- Saint Edmund Rich of Canterbury (Edmund of Abingdon) (1180-1240) -- Saint Rose of Viterbo (1235-1252) -- Saint Sperandia (1216-1276) -- Saint Zita (1218-1278) -- Saint Albert the Great (1206-1280) -- Saint Margaret of Cortona (1247-1297) -- Blessed James de Blanconibus (Blessed James of Bavagna) (1220-1301) -- Saint Nicholas of Tolentino (1245-1305) -- Blessed Peter Ghigenzi (Blessed Peter of Gubbio) (Unknown-1306) -- Blessed Angelo of Borgo San Sepolcro (Unknown-1306) -- Saint Clare of Montefalco (1268-1308) Saint Agnes of Montepulciano (1268-1317) -- Blessed Mattia Nazzarei of Matelica (1252-1319) -- Blessed Margaret of Metola (Blessed Margaret of Citta-di-Castello) (1287-1320) -- Blessed John of Chiaramonte (Blessed John of Caramola) (Unknown-1339) -- Saint Peregrine Laziosi (1265-1345) -- Blessed Sibyllina Biscossi (1287-1367) -- Saint Catherine of Siena (1347-1380) -- Blessed Andrew Franchi (1335-1401) -- Saint Francis of Rome (1384-1440) -- Saint Bernardine of Siena (1380-1444) -- Saint Herculanus of Piegaro (Unknown-1451) -- Saint Rita of Cascia (1381-1457) -- Saint Antoninus (1389-1459) -- Blessed Antonio Vici (Blessed Anthony of Stroncone) (1381-1461) -- Saint Didacus of Alcala (San Diego de Alcala) (1400-1463) -- Saint Catherine of Bologna (1413-1463) -- Blessed Margaret of Savoy (Unknown-1464) -- Blessed Eustochia of Padua (1444-1469) -- Blessed Anthony Bonfadini (1402-1482) -- Blessed Eustochia Calafato (1434-1485) -- Blessed Bernard Scammacca (Unknown-1486) -- Blessed Arcangela Girlani (1460-1495) -- Blessed Osanna of Mantua (1449-1505) Saint Catherine of Genoa (1447-1510) -- Blessed Margaret of Lorraine (1463-1521) -- Saint Anthony Maria Zaccaria (1502-1539) -- Saint Angela Merici (1474-1540) -- Blessed Lucy of Narni (1476-1544) -- Saint John of God (1495-1550) -- Saint Francis Xavier (1506-1552) -- Saint Stanislaus Kostka (1550-1568) -- Blessed Mary Bagnesi -- (1514-1577) -- Saint Louis Bertrand (1526-1581) -- Saint Teresa of Avila (1515-1582) -- Saint Charles Borromeo (1538-1584) -- Venerable Catalina de Cristo (1554-1589) -- Saint Benedict the Moor (1526-1589) -- Saint Catherine dei Ricci (1552-1590) -- Saint John of the Cross (1542-1591) -- Blessed Alphonsus de Orozco (1500-1591) -- Saint Pascal Baylon (1540-1592) -- Saint Philip Neri (1515-1595) -- Saint Germaine Cousin (1579-1601) -- Saint Mary Magdalen de' Pazzi (1566-1607) -- Saint Camillus de Lellis (1550-1614) -- Venerable John of Jesus Mary (1564-1615) -- Saint Rose of Lima (1586-1617) -- Venerable Maria Vela (1561-1617) -- Saint Francis de Sales (1567-1622) -- Saint Josaphat (1580-1623) -- Venerable Mother Maria of Jesus (1560-1640) Saint Jeanne de Lestonnac (1556-1640) -- Saint Jane Frances de Chantal (1572-1641) -- Saint John Southworth (1592-1654) -- Saint Andrew Bobola (1590-1657) -- Saint Vincent de Paul (1580-1660) -- Saint Pacifico of San Severino (1653-1721) -- Saint Veronica Giuliani (1660-1727) -- Saint Lucy Filippini (1672-1732) -- Saint Teresa Margaret of the Sacred Heart (Anna Maria Redi) (1747-1770) -- Saint Julie Billiart (1751-1816) -- Blessed Anna Maria Taigi (1769-1837) -- Saint Vincent Pallotti (1795-1850) -- Blessed Rose Philippine Duchesne (1769-1852) -- Saint Jean-Marie-Baptiste Vianney (The Cure of Ars) (1786-1859) -- Saint Madeleine Sophie Barat (1779-1865) -- Saint Pierre Julien Eymard (1811-1868) -- Saint Catherine Laboure (1806-1876) -- Saint Bernadette Soubirous (1844-1879) -- Blessed Paula Frassinetti (1809-1882) -- Blessed Charbel Makhlouf (1828-1898) -- Blessed Maria Assunta Pallotta (1878-1905). St. Benedict Press & TAN Books, 1977-01-01. Copyright 1977. Paperback. Used:Good. Tan Books & Publishers (USA), paperback (stiff card cover), 1977, 310 pages, plus publisher's catalog at end. I quote from the blurb: 'Mrs Cruz presents a chapter on each of 102 canonized saints, beati and venerables, covering their lives, the discovery of their incorruption, investigations by church and medical authorities, photos where available, and many other remarkable facts.' Slightly worn at corners but otherwise a good clean solid copy. ISBN 0895550660. TAN Books. PAPERBACK. 0895550660 Special order direct from the distributor . New. Tan Books & Publishers, June 1977. Paper Back. New. TAN Books, 1977-01-01. Paperback. New . New Softcover Book of 298 pages. Rockford, IL: Tan Books and Publishers Inc, 1977. Book. Very Good. Soft cover. 8vo - over 7¾ - 9¾" tall. Softcover. Light shelf and handling wear. Otherwise clean, tight, and unmarked. Very neat..
TAN Books. PAPERBACK. 0895550660 . New. TAN Books. PAPERBACK. 0895550660 Remainder mark . Fine. TAN Books. PAPERBACK. 0895550660 BRAND NEW! NOT DIRTY OVERSTOCKS OR MARKED UP REMAINDERS! . New. U S. A.: Tan Books. As New. 1977. Softcover. 0895550660 310pp including bibliography Details the remarkable phenomenon of the incorruption of certain saint' bodies, treated here in a scholarly and competent manner . St. Benedict Press & TAN Books, 1977. Paperback. Good. 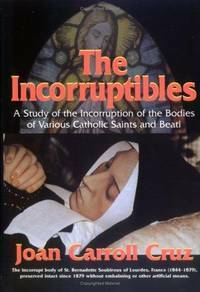 The Incorruptibles: A Study of the Incorruption of the Bodies of Various Catholic Saints and Beati. Rockford, Illinois. : Tan Books and Publishers.. Near Fine. 1977. Soft Cover. 0895550660 . 8vo - 21 x 14 cm. ; 310 pp. Cruz looks at 102 separate instances of incorruptibility. Illustrated with 21 black and white photographs. Sixteen page bibliography. Other than some quite minor shelf wear to the edges of the covers, the book appears to have never been used and could be described as fine. .
TAN Books, 1977-01-01. Paperback. Like New. U.S.A.: Tan Books. As New. 1977. Glossy Soft Cover. 0895550660 310pp including bibliography Photographs 102 canonized Saints, Beati and Venerables are featured that did not undergo decomposition after death, many remaining fresh and flexible for years, or even centuries Imprimatur . U S. A.: Tan Books & Pub. Fine. 1977. Softcover. 0895550660 310pp including bibliography Photographs Fascinating account of over 100 saints and beata Imprimatur Very faint crease on spine, otherwise book is As New . TAN Books. PAPERBACK. 0895550660 Nice used book. Minor wear to cover edges. . Fine. TAN Books, 1977-01-01. Paperback. Acceptable. Exterior shows light wear with some spotting. Inside has inscription, but appears otherwise unmarked. TAN Books. Used - Like New. Trade paperback. Like new; no internal markings. No pricing stickers. No remainder mark. Stored in sealed plastic protection. In the event of a problem we guarantee full refund. 1977 Trade paperback. TAN Books, 1977-01-01. Paperback. Good. Paperback book in good condition. TAN Books. Used - Very Good. Trade paperback. Tiny curl to lower front cover tip, else, Like new; no internal markings. No pricing stickers. No remainder mark. Stored in sealed plastic protection. In the event of a problem we guarantee full refund. 1977 Trade paperback. TAN Books. Used - Good. Former Library book. Shows some signs of wear, and may have some markings on the inside. TAN Books. PAPERBACK. 0895550660 Fast handling - Orders prepared for Shipping Next Business Day! . Fair. TAN Books, 1991. Paperback. Good. Disclaimer:A copy that has been read, but remains in clean condition. All pages are intact, and the cover is intact. The spine may show signs of wear. Pages can include limited notes and highlighting, and the copy can include previous owner inscriptions. The dust jacket is missing. At ThriftBooks, our motto is: Read More, Spend Less. TAN Books, 1991. Paperback. Acceptable. Disclaimer:A readable copy. All pages are intact, and the cover is intact. Pages can include considerable notes-in pen or highlighter-but the notes cannot obscure the text. At ThriftBooks, our motto is: Read More, Spend Less.Dust jacket quality is not guaranteed. TAN Books, 1991. Paperback. Good. Disclaimer:A copy that has been read, but remains in clean condition. All pages are intact, and the cover is intact. The spine may show signs of wear. Pages can include limited notes and highlighting, and the copy can include previous owner inscriptions. At ThriftBooks, our motto is: Read More, Spend Less.Dust jacket quality is not guaranteed. TAN Books. PAPERBACK. 0895550660 Item in good condition. Textbooks may not include supplemental items i.e. CDs, access codes etc... . Good. Harcourt Brace Jovanovich. Good+ with no dust jacket; Previous owners name stamped inside.. 1963, 1964. Softcover. 0-15-650880-X . 8vo; 124 pages . TAN Books. Paperback. GOOD. Spine creases, wear to binding and pages from reading. May contain limited notes, underlining or highlighting that does affect the text. Possible ex library copy, thatâll have the markings and stickers associated from the library. Accessories such as CD, codes, toys, may not be included.